We all have vivid memories of our families, whether they were experienced firsthand or through stories told sitting on your grandmother’s lap. For Mary Stuart Hall, one of her recent family memories came in the form of a letter from 1847. By sheer luck, she found this letter from a relative as she organized things with her mother and it quickly became the inspiration for her new solo show, The Topography of Text. Topography is a continuation of her piece in MINT’s 2nd Juried Exhibition, Here to Go, where she won “Best in Show.” The Here to Go piece used Braille text. The common theme? How we communicate with each other. The Atlanta-based artist has special relationship with text as she is captivated by how we use meaning and attach them to certain words. “I'm so fascinated by how we take for granted meaning and how we assume that meaning is fixed," she says. "In our day-to-day lives, we have this idea that words mean what they mean and we give words those meanings. They don't have any meaning on their own without the interplay of communication." This exhibition is a way for her to explore the written word by turning them into physical and tangible forms while learning more about her family through memories. “It's been a while since I've done something so personal in terms of relating to my own family history,” she says. 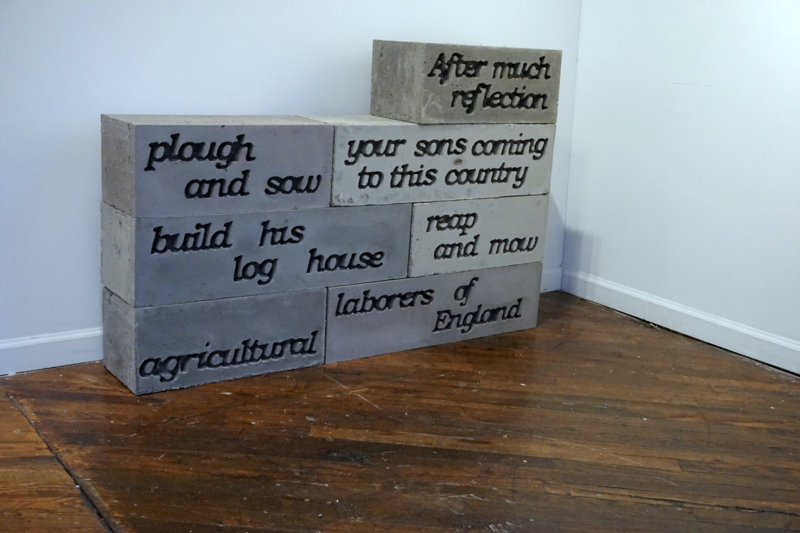 For Topography, Hall took four verses from the nearly 1,200-word letter and split them into four sculptures. Each sculpture, concrete blocks stacked on each other, spell out about 100 relief-printed words from the letter. “The first one gives a little context about the letter," Hall says "The next verse says where they are and the last two verses are really political. That's where it says that, ‘a conquest of Mexico will precipitate the event where the foundation is rotten, the superstructure must fail." She says these last two verses relate to our current political environment, where refugees are immigrating to other countries and encountering rejection. “This could be right now," she says. "It is similar to the political climate right now." While she only shares small glimpses into her past, Hall is very much interested in seeing how viewers interact with the installations and put together their own story. Check out the opening of Hall's The Topography of Text at MINT Sat., Jan. 9 from 7-10 p.m.